"Its latest release includes [Walt] Gwardyak's 2018 arrangement of 'Peter and the Wolf,' the first new big band re-imagination of Prokofiev's masterpiece in more than 50 years." What? Did I miss something? 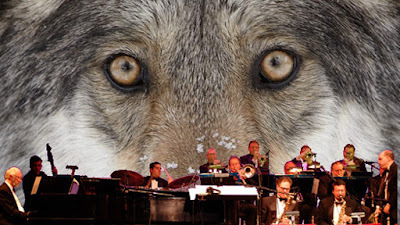 I love Prokofiev, and as I recently mentioned in my review of Bjorn Morten Christophersen's Woven Brass from 2L Recordings, Peter and the Wolf was my earliest introduction to the world of classical music. I've owned numerous copies of this work over the years, with narration by everyone from Sebastian Cabot to David Bowie, but I've never heard this, a jazz version of this piece. A perfunctory search on the internets reveals several performances by David Tennant and the Amazing Keystone Big Band ranging from 2012 to 2015. That undermines the previous claim from the press release of this new performance from the New England Jazz Ensemble, although the wording in the above pull quote is very specific. I have found a classic 1966 recording from Jimmy Smith using Oliver Nelson's big band--something I should know about but don't--a perhaps that explains the "more than 50 years" comment. Still, I'm surprised by this idea and when I first received this CD in the mail (the day after I reviewed Woven Brass, by the way) I rolled it around in my head for a while before declaring that yeah, I'm sure it works great. When I finally got around to listening to this version a few weeks ago, I immediately smiled as soon as the musical introductions began. It does work. It's a fantastic concept. I should have expected this measure of success after we've seen such amazing mash-ups of jazz and classical such as the legendary Bach series from the Jacques Loussier Trio. But wow. But wait, there's more! 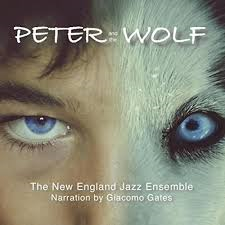 As you know, most versions of Peter and the Wolf last for around a half an hour, so the NEJE puts its jazz imprint two more loose Prokofiev adaptations--"Serge's Birds" and "Power Serge"--and one more original piece with a lupine theme called, of course, "Wolves." These are mostly improvisations on the themes found in the main work, but the musicians are allowed to explore further without detracting from the story. The magic of this album is the smooth, crisp and fully-realized musical performance from the NEJE. You can tell from the results that everyone had a wonderful time during the recording. As for me, I have to track down that 1966 Jimmy Smith version. I bet that's the cat's pajamas as well.